A beloved children’s book comes to life on the Beef & Boards Dinner Theatre stage for the first time as the Pyramid Players present “Dr. 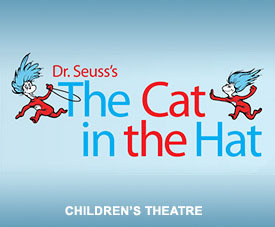 Seuss’s The Cat in the Hat” to open the 2019 Live Theatre for Kids season Feb. 15. The performances run through March 2. From the moment his tall, red-and-white-striped hat appears around the door, Sally and her brother know that this is the funniest, most mischievous cat that they have ever met. With the trickiest of tricks and the craziest of ideas, he is certainly loads of fun. He turns a rainy afternoon into an amazing adventure. Andy Kear stars in the title role, with Nikki Miller as Sally, Chris Trombetta as her brother, and Sally Scharbrough as Fish. AnnaLee Traeger and Christine Zavakos round out the cast as Kitten 1/Thing 1 and Kitten 2/Thing 2, respectively. The show is directed by Elizabeth Stark Payne and choreographed by Jennifer Ladner. The musical director is Kristy Templet. Ed Stockman is the stage manager. “Dr. Seuss’s The Cat in the Hat” is the first production in the 2019 Live Theatre for Kids series at Beef & Boards. Pyramid Players productions are presented without intermission, are designed for all ages but offered particularly for children in preschool through sixth grade. Children also have an opportunity to meet the cast after each show. Performances are at 10 a.m. Fridays, and at 10 a.m., 1 p.m. and 3:30 p.m. Saturdays. All tickets are $17 and include a snack. For more information or complete show schedule, visit beefandboards.com.